When you think about typical African wildlife, a few animals almost certainly spring to mind: zebras, wildebeest, lions, cheetahs and buffaloes. But fossil records tell us that these species aren’t originally from Africa. In fact, their ancestors originated in Asia when Africa was separated from the rest of the world by sea, between 40 and 50 million years ago. Members of the “Big Five” and other animals most of us consider thoroughly African only arrived on the continent after the formation of a land bridge in the Levant (a section of the ancient Eastern Mediterranean) with Asia around 30 million years ago. Before that, a very different group of mammals – the Afrotheria or “African beasts” – lived on the continent. This superorder, or clade, consists of several creatures you’d recognise today. Among them are dassies (rock hyrax), sea cows, golden moles, sengis (elephant shrews) and aardvarks. Afrotheria: a family tree full of very different-looking relatives. 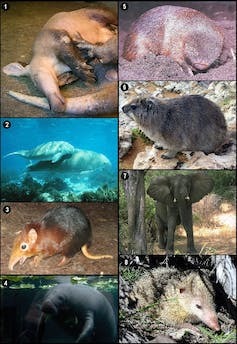 These animals are all related to elephants; though they look very different externally, inside they share unique DNA signatures inherited from a common ancestor born more than 60 million years ago on African soil. Most are still endemic to the continent. The ancestral line of all these creatures is deeply rooted in Africa, except for the sea cows which was a mystery for a very long time. Their genes confirm that they’re Afrotherians. So one would expect them to have their evolutionary origin in Africa, but the oldest fossils ever recorded were actually found in Jamaica, on the opposite shore of the Atlantic Ocean. One set of fossils was found in 1855; a second in 2001. These belonged to the four legged Prorastomidae, a family of primitive, amphibious sea cows which looked like hippos. This discrepancy suggested that sea cows’ ancient ancestors weren’t African, which is paradoxical for representatives of the Afrotherians. But thanks to two more recent fossil discoveries, one in Senegal and one in Tunisia, my colleagues and I at the University of Montpellier in France were able to solve this mystery. Sea cows are quintessentially African. Here’s how we found out. Decades of collaborations between palaeontologists from the University of Montpellier and various African countries has resulted in the university having a vast collection of beautiful fossils. By 2013, most of these had already yielded their secrets – but two were still puzzling the experts. One was a vertebra found during a dig in Senegal. The other was a piece of ear bone found in Tunisia. After hours of anatomical comparisons and endless discussions with specialists all around the world, we finally managed to prove that these remains belonged to the earliest known sirenians – the family to which sea cows belong. The vertebra was nearly identical to those found in Jamaica. The piece of ear bone was a little older (dating back 48 million years) and looked more primitive than those of the Jamaican species. These evidence suggest that sea cows existed and were already widespread in Africa well before their descendants crossed the ocean and reached the New World. Both ancient Jamaican and African sea cows had four legs and lived on land. Like ancient Cetaceans – whales, dolphins and porpoises – sea cows started as terrestrial animals and later evolved into aquatic mammals. Now we can confidently say that sea cows are truly 100% African mammals. They’re in good, if limited company: there are fewer than 100 extant Afrotherian species but they represent a sixth of overall mammalian genetic diversity. 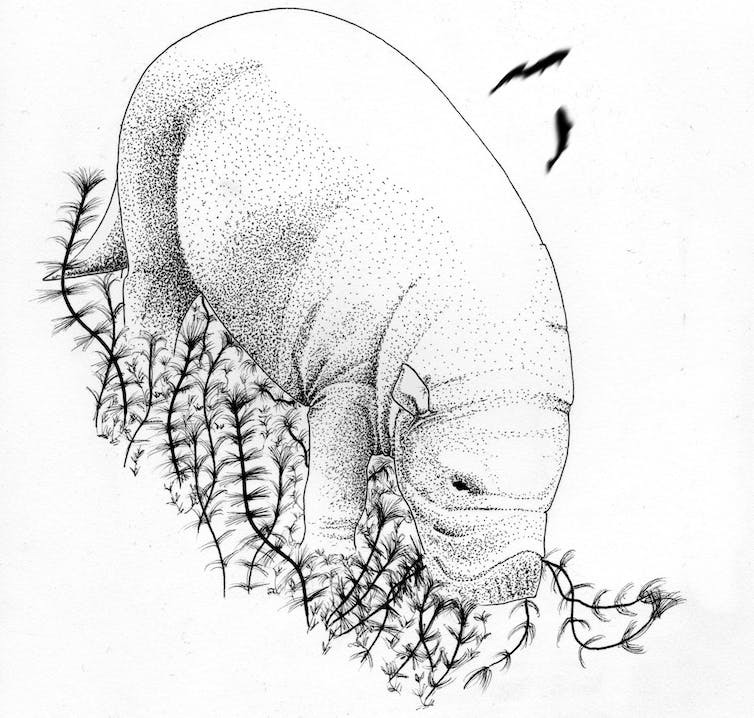 An artist’s impression of an ancient, 100% African sea cow. Mammals are divided into six big clusters called clades. One clade represents all living species descended from a single common ancestor – so, if we could come back in the past, we would see all the lineages of existing mammals coming down to only six remote ancestors. When geneticists discovered that the very different animals who make up the Afrotherian clade were related, they also realised that Afrotheria were becoming increasingly rare. Most went extinct after they were out-competed by the arrival of Asian species in Africa 30 million years ago. 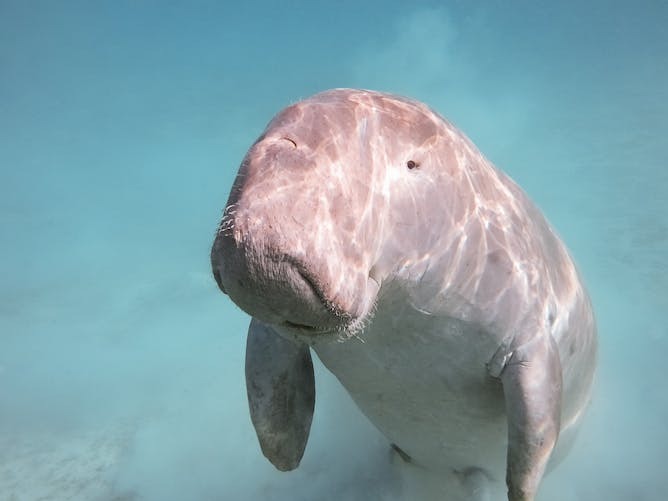 Confirming that sea cows are Afrotherians means the clade is more diverse than we thought, and adds to an understanding of its evolutionary history. That, in turn, helps us understand its current standing and even examine scenarios for its future conservation.